When looking for a recipe for a strawberry cream layer dessert, you're bound to run into a recipe for a trifle, the classic layered dessert. What if you find yourself with some fresh berries and pound cake and don't want to go the old "fake strawberry shortcake" route? You make a trifle! A trifle is a layered dessert with cream and fresh berries. Since strawberry season is coming soon, this recipe features the delicious flavor of the strawberry. This strawberry cream layered dessert uses pound cake like most trifles do. You can make your own pound cake or just pick one up at the store. Some recipes ask the baker to cut the crusts off of the pound cake, but I have found that people don't notice the crust of the cake, they are too busy being delighted by the dessert. 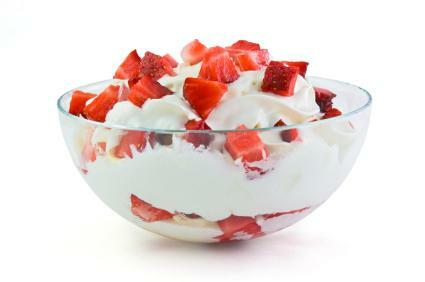 Strawberry cream layered desserts can be made in one large bowl or you can make individual desserts in smaller glass bowls. The layering effect can be a striking visual so glass bowls are best but not necessary. For a more enticing visual effect, you can drizzle some of the strawberry sauce along the inside of the bowl, giving the dessert a drippy, trippy look. Whipped cream will deflate the longer it stands so be sure to make the whipped cream last and add it to the strawberry cream layered dessert just before serving. In a medium saucepan, whisk together the sugar, cornstarch, salt, and zest until well mixed. Mix in the Cointreau and the egg yolks until well mixed. Mix in the milk and cream until smooth. Place the pan over a medium flame and stir constantly until the mixture comes to a boil. Lower the heat slightly and continue to cook until thick, about 3 minutes. Strain through a fine strainer into a bowl. Cover the pastry cream with plastic wrap, being sure that the plastic wrap is touching the surface of the pastry cream. This prevents a skin from forming. Place the uncut strawberries in a food processor and pulse until pureed. Strain the puree through a strainer into a medium saucepan. Add the cornstarch and the Cointreau. Place over a medium flame and bring to a boil while stirring. Cook until the sauce becomes thick. Remove from the heat and add the sliced strawberries. Taste and add sugar to taste if needed. Using a 4 quart glass bowl, place half of the cubed pound cake in the bottom of the bowl. Scatter half the sliced strawberries over the cake. Cover the berries with half the pastry cream. Pour half the strawberry sauce over the pastry cream. Just before serving, make the whipped cream and top the strawberry cream layer dessert with the whipped cream. You can use a whisk, hand beater, or stand mixer to make whipped cream. Pour the cream into a large bowl and beat until it starts to firm. Add the sugar and continue to beat until the sugar is well incorporated. Add the vanilla extract and beat until the cream forms stiff peaks. If you have any of the berry sauce leftover you can drizzle it over the dessert after the whipped cream has been added. .